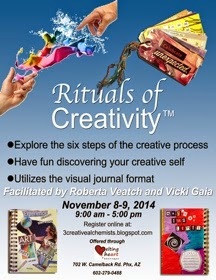 Rituals of Creativity to be offered this Fall. I'm sad to see the last week of class is coming to an end, but happy to announce we will be teaching the online course once again, October 20 - November 30. Roberta and I had so much fun teaching this course over the summer. We had such wonderful creative students who participated and shared with others. All of us learned and were inspired. So much so that I continued in my journal and finished it!